When asked “Which of the following best describes your employment status before you had your current contract job?,” 42% of respondents—in a recent iCIMS survey—said they worked full-time, permanent positions before moving over to contract work, aka the gig economy. Furthermore, 59% of respondents who are currently contract workers say their contracts are indefinite. This may be bad news for employers looking for talent to fill vacant roles, but it is fantastic news for those freelancers who are secure in their gig roles. In a new report—Myths & Realities of the U.S. Gig Economy in 2019—talent acquisition and software as a service (SaaS) platform, iCIMS, surveyed 1,000 Americans who hold at least one contingent job as their primary or secondary income. iCIMS also examined hiring data from the 4,000 companies using its recruiting platform to take a deeper look at this new type of working arrangement. While many employers are turning to the gig economy to help fill vacant positions quickly, many workers are now seeing the benefits of “being their own boss,” and are choosing to leave their employers in the dust. However, the gig economy may not be all it’s cracked up to be. The iCIMS report takes a page out of the Mythbuster’s playbook and busts some common myths about gig workers. For example, the gig economy isn’t that new. 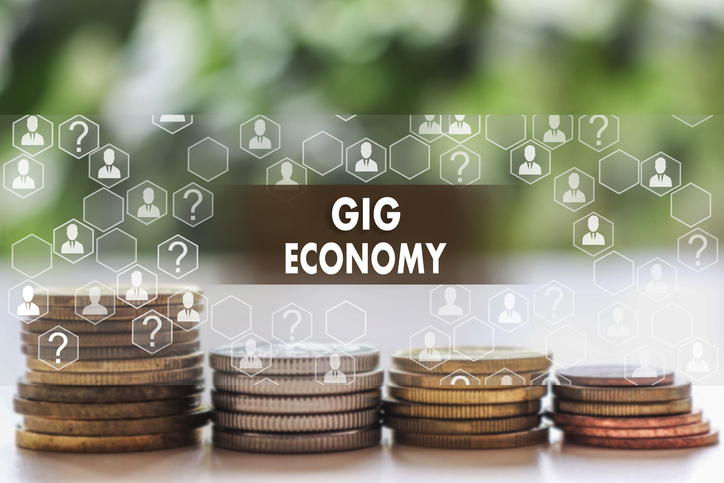 iCIMS reports that 40% of respondents have been working in the gig economy for more than 5 years, with 70% of gig workers relying on this arrangement as their sole source of income. Not too many plan on transitioning back to full-time employment either, according to only 31% of respondents who say they’d like to go back to permanent, full-time employment status. Also contrary to popular belief, the gig economy isn’t just made up of Uber and Lyft drivers. It consists of knowledge-based careers suited for different industries, including leisure and hospitality; education and health care; financial and professional services; and retail. When contract workers chose to leave full-time, permanent employment, they’re also giving up the luxury of employer provided benefits, like healthcare insurance and retirement plans. However, iCIMS suggests that contract workers build in the cost of such benefits into their “going rate” in order to help balance out the costs. Build a robust network of peers and industry professionals. “Most contingent workers find their next assignment through referrals from friends or professional network contacts. It’s essential to invest in networking through conferences and social media, in addition to delivering a quality job performance,” says iCIMS. Secure at least three clients and/or projects to ensure a continuous paycheck. iCIMS says that most contract workers have, on average, four projects they are working on at any given time, which helps keep the revenue flowing in. Find new projects through sectors that have the most contingent job openings. As mentioned above, the most popular industries hiring contract workers are leisure and hospitality; education and health care; financial and professional services; and retail. Contract workers may have the best luck finding gigs in these industries, assuming they have the applicable skills and knowledge. Contract work may be your ticket to relocation. According to iCIMS research, only 15% of respondents said they wanted to land a full-time job at the company they contract for. While this number isn’t the greatest, it does provide employers with a little hope that they’ll eventually be able to recruit these workers into their companies. And for contract workers looking to move of rural areas and into bigger cities, this would be the best way to get your foot in the door. Technology has had a huge impact on the gig workforce, allowing people to work wherever and whenever they want. And with the growing “always on” employment trend, it makes sense why some workers are turning to the gig economy and shying away from traditional employment arrangements. And this may hold especially true for government workers. Could the Government Lose Its Workers to the Gig Economy too? After the government shut down mid-December, many government workers were either furloughed or forced to work without pay. With the next budget crisis right around the corner, could this be the start of more government workers seeking a more stable career through the gig economy? “Many Americans pursue a career with the government because it provides job security, but as today’s numbers show, with the recent five-week long shutdown, more workers are turning to the gig economy to pay their bills on time,” said Henderson. The gig economy is empowering workers to become their own boss, set their own schedules, and demand to be paid what they’re worth. Will more full-time, permanent employees opt to travel down the same route? Only time will tell, but for now, it’s a growing trend that continues to have many benefits for all parties involved.